"A breathable, oil-absorbing treatment that minimizes the look of pores and redness while giving skin a smooth, matte finish that lasts throughout the day." The pomegranate mattifying treatment ($38) is a light-weight treatment that claims to treat enlarged pores, redness and improve skin's surface overall. It is formulated to be used as a primer, over moisturizer or alone. The texture is similar to that of a gel like primer and I use a small amount after moisturizer. It vanishes almost immediately, without leaving a film and creates a super smooth canvas, minimizing pores. If you have dry skin, I would recommend using it over moisturizer since it has oil absorbing properties. If you have oily skin, you could use this in place of a moisturizer and skip primer too. It is very lightweight and holds makeup in place and keeps me looking fresh for a very long time. Even the creamiest of blushes stay put. 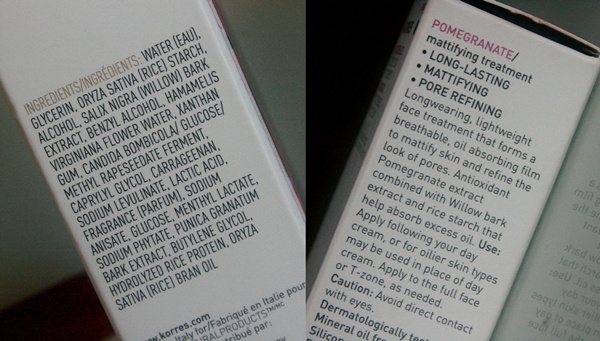 Korres also has a pomegranate mattifying primer which works on a similar concept except that this truly leaves a matte finish and claims to work with treating treat redness and pores. I do have very visible, quite large pores and I cannot say it treated them or made them disappear but, for a silicone-free base, this does a fabulous job shrinking them prior to makeup application. I do prefer a dewy look when I'm done with my makeup but, a clean canvas with a matte finish as a base helps makeup glide on so easily. I've had great luck with Korres' skin care range in the past and this one too is a winner for me. I would reach out to this more during summer and since it is pricey, I would save it for use during special occasions when I want my makeup to look fresh and neat for hours together. It also has a mild rose scent that I absolutely love. Have you tried the Korres Pomegranate Mattifying Treatment? Never tried it, but looks like a great product! My esthetician told me my pores are closed, so that is good, but they're def visible! That could help me! Thanks for the review. hmm...i havent tried this either! i may just have to! It is worth a shot. Would be a great pick for summer! I wanted to love this, but it pilled on me every single time. I tried it both under and over makeup, same result. Oh really? That's not good to hear. What is your skin type?